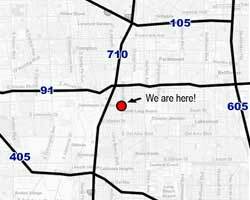 We are located just off the junction of the 91 & 710 freeways, about 25 minutes south of downtown Los Angeles. For directions from your location to us, please click on the Mapquest link at left. Parking instructions are detailed below. Street parking is usually available directly in front of the studio on Atlantic Ave. Signs indicate a two hour parking restriction Monday through Saturday, 8am-6pm, with an additional street cleaning restriction on Wednesday mornings. Enforcement is inconsistent, but tickets are issued, and exceeding the posted time period is at the client's risk, with the studio bearing no liability in the event of a parking ticket. Parking is unrestricted on 60th and 61st Streets, a half-block each north and south of the studio. The studio also has its own gated parking lot in the back of the building. Our private gated parking is accessed through the parking lot of the "Stallion Inn" motel, one building north of the studio. Please Note: The Stallion Inn parking lot may not be used as a parking or waiting area by studio clients/guests at any time, for any duration, no matter how short or momentary. This includes a prohibition against parking or waiting directly in front of the studio's gate. Vehicles not belonging to Stallion Inn motel guests that are parked motel parking lot are subject to tow without warning. If you will be parking in the studio's back lot, you must briefly park on the street and walk back to ensure that the studio's parking lot gate is unlocked and open, before driving any vehicle into the Stallion Inn parking lot on the way to studio parking. Gate is locked between sessions, and will be unlocked approximately 10-15 minutes prior to session start time. Once you have checked and found the studio's gate to be open, then drive all the way to the back of the motel parking lot, and turn left to pass between the columns and through the large off-white gate into the studio's parking lot. Park a single vehicle as far forward as possible, directly in front of the studio's back door. Groups arriving with multiple vehicles to park will receive specific parking instructions with reservation confirmation, and/or be directed into parking spaces upon arrival. All recording studio and rehearsal studio sessions will be booked in Studio A. Regardless of parking arrangements, please direct all members of your party to enter and load in through the building's back door, located in the parking lot, directly into Studio A. There is no recording/rehearsal studio access through the building's front door.